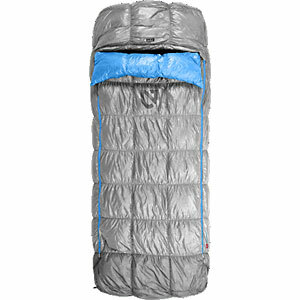 Nemo designed the Strato Loft sleeping bag for quick camp setups and breakdowns. Just roll up the Strato Loft, with your sleeping pad still inside, until you reach the next camp or your relative’s floor. 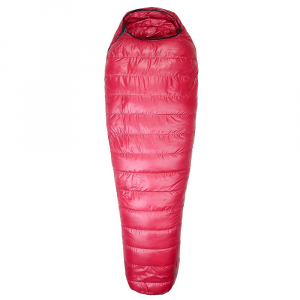 Compatible with Nemo’s Cosmo series pads, a stretch sleeve holds in place sleeping pads up to 5 x 25 x 76 inches. The Strato Loft is good down to 25°F (-4°C) and will help keep you warm even if things get wet since its 700 fill power down is treated with DownTek nanotechnology. The rectangular bag has a hood, roomy cut, and stretch stitching. Dual zippers let you zip two Strato Lofts together, or simply give you even more room to move. The Strato Loft bag features box baffle construction, fully insulated Blanket Fold to hold in warmth, down-proof ripstop nylon shell fabric, waterproof/breathable footbox, and two internal mesh pockets. Finally a bag for stomach and side sleepers that actually works. You experience the feeling of almost sleeping in big down filled comforter. This is the bag I've been waiting my entire life for. I'm a side and stomach sleeper and can truly sleep peacefully without getting all twisted up in a traditional mummy bag. Soon to be released in Spring 2013, this bag is very unique, very roomy and kept me warm at 22 degrees, rated for 25 degrees. The dual zips are very nice. I can use in any tent despite what side the door is on!! The Blanket Fold feature helps keep the warmth inside the bag where it belongs, also cool pillow stuff pocket holds your pillow in its place, no more waking up at 3 am wondering where your pillow has migrated to. This bag is the easiest bag in the world to get into. Once inside, plenty of foot room, arm room, etc. This product is very well made, 30 denier nylon taffeta lining almost has a soft silk like feel to it. Congrats to the engineering team !! They made Poppa Greg Happy !! I have used the Nemo and Big Agnes inflatable insulated pads on this bag and they all work fine, bottom of the bag is very similar to the Big Agnes sleeve system, great at keeping the pad in one place. Even tho this bag is rectangle cut, I never felt any cold spots inside the bag. Like sleeping with a comforter at home. This bag is designed to work WITH your current sleeping pad or mattress. I use a Therm-a-Rest NeoAir 25" wide mattress. It fits the bag perfectly. Zips up on both sides making it very versatile. 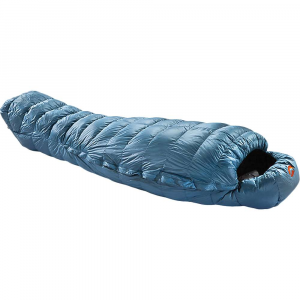 It should be called more of a sleep system than a sleeping bag. Warmth: The bag keeps you warm. I like to wear basketball shorts and t shirt to bed. Kept me warm in upper 30 degree (F) temps. Fit & Comfort: The overall fit and comfort is amazing! The length for me is great (I'm 6' tall) and would fit someone a bit taller too. The hood is comfy just like the comforter top. I just use it to hold my pillow (Sea to Summit Aeros) in place. The thing I like the MOST about this is the foot room. It is a rectangle shaped bag. Unlike a mummy style, you can move your feet around quite a bit in this bag. I move a lot when I sleep and will sleep on my side mostly. Entry & Exit: With dual zippers, one on each side, it is very easy to get in and out of the sleep system. Moisture: I have not had to deal with moisture on the bag yet, but I am confident it will keep me dry. It is built well with rip-stop nylon. Packability: It packs well. It is a little on the heavy side (3 lbs) when packed, but that is a tradeoff for extreme comfort that I'm willing to deal with. My other lightweight bag is 2 lbs and is nowhere near the quality and comfort of this one. I use a Sea to Summit medium size compression waterproof bag to put it in when backpacking. packs down small with this compression sack. Loft: The bag puffs up well after taking out of the compression sack it was in for the hike in. Seems the loft stays even. Ease of Use: Very easy to use and simple. Features: Has sidewalls that have storage pockets on the inside for your items (cellphone, GPS, flashlight, etc.). Construction and Durability: Seems very well made. The fabric seems lightweight, but sturdy. I wouldn't be dragging it over rocks. It will be just fine in your tent or under your UL shelter. Conditions: I have used this bag on two different trips packing in Northern California's El Dorado National Forest area. Both trips overnight lows were in the upper 30's (F). The bag impressed me. I slept great and felt very comfortable. Felt like I had a mattress and comforter from home. This bag is pricey, as are most other well made bags. When it comes to packing in, I have decided to make my overnight sleep a higher priority so a higher price and littler more weight is well worth it for me. Welcome to Trailspace, Mikey! Thanks for sharing a review of your Nemo bag. Got any pictures of it to show off its features? Finally a comfortable bag for side sleepers. Wake up untwisted on the pad! I sleep on my arm with it extended and finally there's a bag for me to do that. With zippers on both sides I can sleep on either arm, not just the side with the zipper. 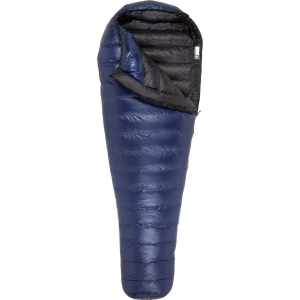 The sleeve that holds any large size pad keeps the sleeping bag from becoming a boa constrictor and making you wake up with a twisted spine. 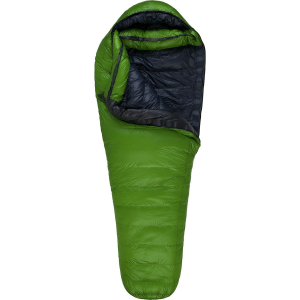 The bag's hood allows you to sleep in it or on top of it and the foot box keeps your feet cozy. Treated down makes water absorption less of a problem too. My only negative observation is the bag's weight and the fact that it only comes in one size. I realize thought that adding an extra zipper and making the bag rectangular adds to the weight. Making a shorter bag would allow the use of a smaller pad (reg. size pad) thereby shaving a few ounces from the pad and bag. However, a good night's sleep can more than make up for the extra weight. As a stomach sleeper this bag has been long awaited. As a stomach sleeper this bag has been long awaited. I'm 5'9" and 210 lbs and this bag has plenty of room. I have tested it around 38 degrees F and slept very warm without anything more than underwear. I use a Nemo pad with it and actually like the fact that it requires a pad because you can adjust the comfort rating with the pad. I think this bag performs very well and within its specifications. Someone mentioned that it does not come with a large storage bag for home use but mine did. I ordered it directly from Nemo Equip when they had one of their rare sales so I got mine for a little less than what is average here. I couldn't be happier with this bag as a stomach sleeper and I will most likely never use a mummy bag again (it does hug you somewhat to keep the dead space a little smaller, but nothing like the constriction you feel with a traditional mummy bag). I would gladly sacrifice the few extra ounces this bag comes with for a great night's sleep. I'm not an ultralight packer so this is the perfect bag for me. The most comfortable bag for non-mummy sleepers. Reasonable weight, comparable to 200-300 dollar mummy bags. Must use an inflatable pad inserted into slot in bag. I've been planning to carry this on the AT this spring. It unzips on both sides and when you couple it with one of the Nemo inflatable pads ...It is sleep heaven. Water resistant down, pillow pocket, storage spots for headlamp and the cool baffles! Wow! Packs like a regular bag in the real compression stuff sack that comes with it. Less expensive than some of the quilt sleep systems out there. The NEMO Strato Loft 25 is not available from the stores we monitor. It was last seen August 2, 2018	at REI.